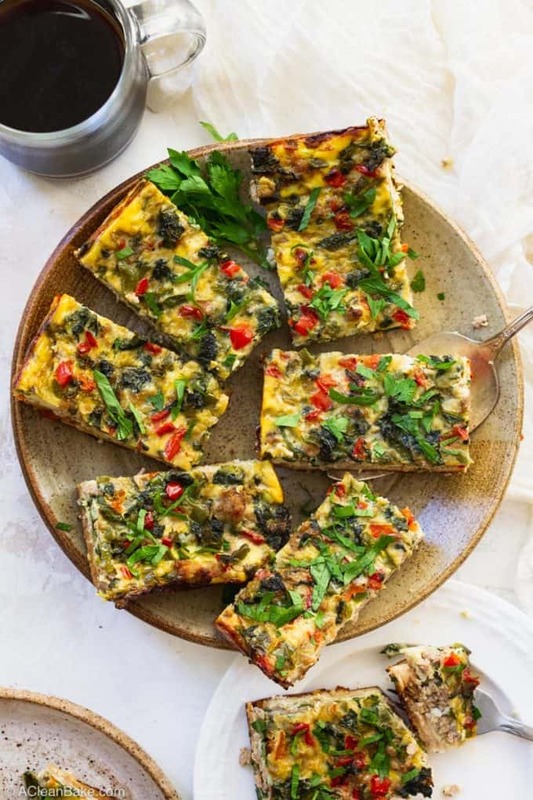 As we dive headfirst into fall, and the holiday season will be here before we know it, easy, make-ahead breakfasts are sure to come in handy! 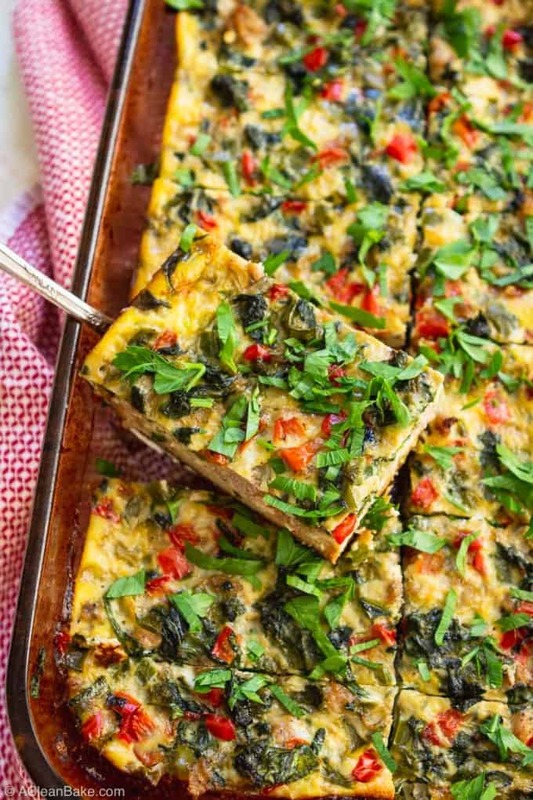 So, be sure to bookmark this gluten free breakfast casserole. In just a few simple, real food layers, this dish provides a hearty, one pan meal for a crowd, or stocks your fridge with a satisfying breakfast for the week. Plus, make sure to keep reading for make-ahead tips! This post was created in partnership with Udi’s Gluten Free. Thank you for supporting the brands that make A Clean Bake possible! If ever there was a dish that proved that appearances can be deceiving, it’s a breakfast casserole. 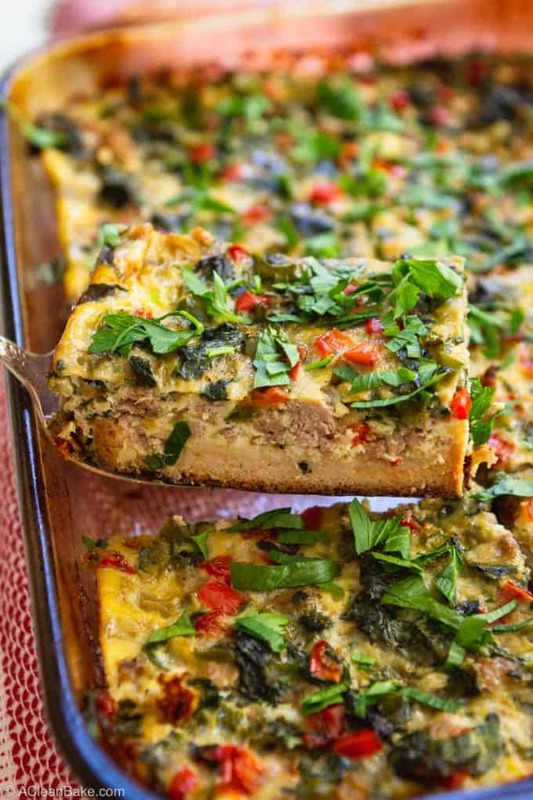 …then this breakfast casserole recipe has your back. When you wake up late and have barely enough time to get yourself showered and to work on time, let alone make breakfast, you know what is a real lifesaver? That breakfast casserole in your fridge. Want to stock your fridge or freezer, or a friend’s, for a time in their life when they’re going to be too distracted to cook? Thinking of you, all of my peers whose friends are expecting babies this fall and winter! 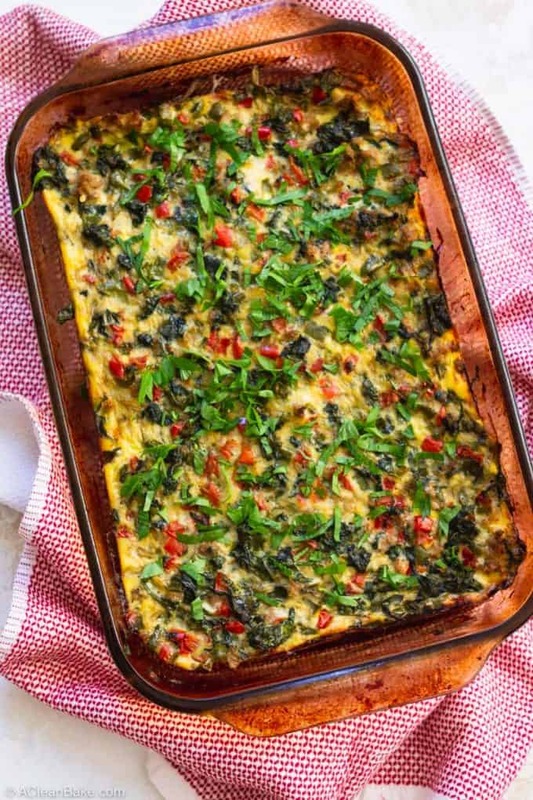 This gluten free breakfast casserole freezes perfectly in individual portions, to be thawed as needed. Just want to add a hearty, one-pan meal to your meal prep routine? Say it with me now: Break! Fast! Cass! Erole! What is a Breakfast Casserole? A casserole is a uniquely American, mostly Midwestern thing that – I admit – I didn’t eat a ton of growing up (even though I did grow up in the Midwest). When you think of a casserole as nothing more than a full, balanced meal cooked together in a baking dish (aka a casserole or casserole dish! ), it starts to sound like what it is: a really practical recipe. If you’re turned off by casseroles, call it an egg bake. The problem with casseroles, and why I tend to shy away from them, is that the nutrition facts tend to make me shudder. So many casseroles require processed ingredients like canned cream of mushroom soup in the dinner versions, and frozen hash browns and ultra-processed breakfast sausage in the breakfast versions. What makes my version different? Most notably, we won’t be using packaged breakfast sausage, or canned anything! The recipe calls for fresh ingredients like ground meat, fresh eggs, herbs and spices, and ripe veggies. It contains nothing out of the ordinary, and certainly nothing you wouldn’t eat if it weren’t in a casserole. In other words: real food ingredients, just the way we like it. A breakfast casserole is made by layering ingredients on top of one another, then covering it with eggs to bind it together, and baking it. Typically, one layer is a starch, one is a protein, and one is a veggie (or usually a veggie mixture). The starch is going to be the base layer, so that it forms a sturdy base to hold all of the rest of the fillings. I’ve seen people use hash brown potatoes as the base, but I prefer bread which, I think, creates a sturdier base. The last thing you want is to lift your perfect slice of breakfast casserole out of the pan, only for it to fall apart under the weight of the fillings. It’s really important to have a sturdy base! I used Udi’s Gluten Free Delicious Soft White Sandwich Bread for this recipe. Udi’s Gluten Free just completely reformulated their sandwich breads, and this new line of delicious sandwich breads (it also comes in a multigrain variety) is softer, denser, and heartier than most other gluten free breads out there. They like to say it’s their best bread ever and I can’t help but agree! Udi’s sandwich bread really holds up under the weight of meat, veggies, eggs, and all the moisture that comes with those ingredients. That’s a tall order for any bread, and especially a gluten free bread. Once you’ve laid down a base of hearty gluten free bread, you’ll top it with a layer of cooked sausage. One of the hallmarks of a breakfast casserole is using packaged Italian sausage, but not in my kitchen. You’ll make your own sausage for this recipe, and it couldn’t be easier. You’ll cook the ground meat with onion, salt, black pepper, tarragon, and a little bit of lemon juice. It’s an easy process that doesn’t add much time to the overall prep time of the recipe, but saves you from eating all of the preservatives and artificial ingredients in many store bought sausage products. Next, you’ll add a layer of vegetables. I always use bell peppers, which are the perfect mild texture that soften but don’t lose their shape in the heat of the oven, and baby spinach. 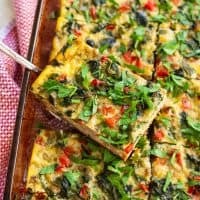 You will cook them down in a large skillet over medium-high heat before adding them to the breakfast casserole, so that they shed some of their moisture (spinach and bell peppers have really high water content), but not cook all the way through. This way, your casserole doesn’t end up getting soggy as it bakes. Finally, you’ll beat some eggs with a bit of milk (any kind), and pour it over the hearty layers. Note that the egg mixture doesn’t include any seasoning; that’s not a mistake! All of your meat and veggies should be well seasoned, so your casserole won’t need any additional seasoning. 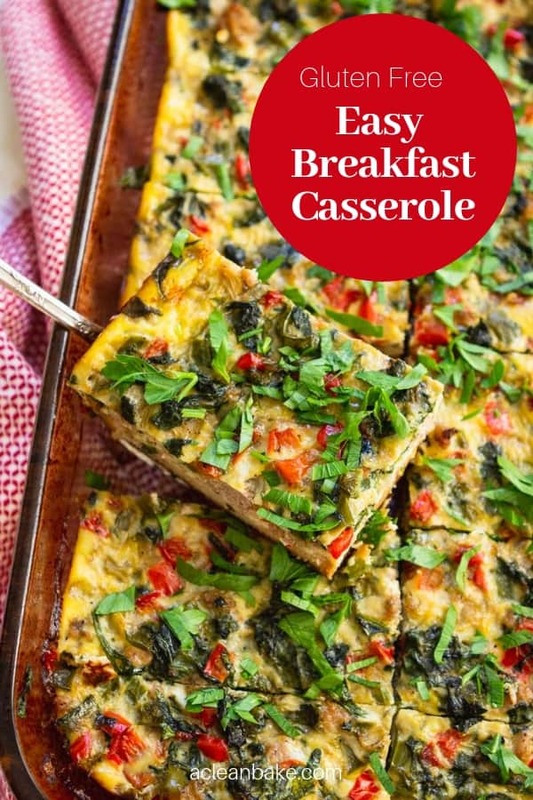 Then, all you have to do is bake the casserole in a preheated oven and you’ll have a hearty, satisfying breakfast for a crowd – or just for a while. Whether you’re making this for your family, or for a crowd, you may need to make it ahead of time. It is possible, but I don’t recommend assembling the entire casserole until just before baking. Cook the sausage according to the recipe. Let it cool completely, then store it in the refrigerator in an airtight container. Cook the vegetables according to the recipe. Let the mixture cool completely, then store it in the refrigerator in an airtight container. Grease a 9×11″ baking pan with oil or cooking spray. Add 8 slices of Udi’s Gluten Free Sandwich Bread in a single layer. Add the meat mixture in a single layer covering the bread, then add the veggies in a single layer covering the meat. Tightly cover the baking pan and store in the fridge. Beat together the eggs and milk and store it in the fridge in an aright container. 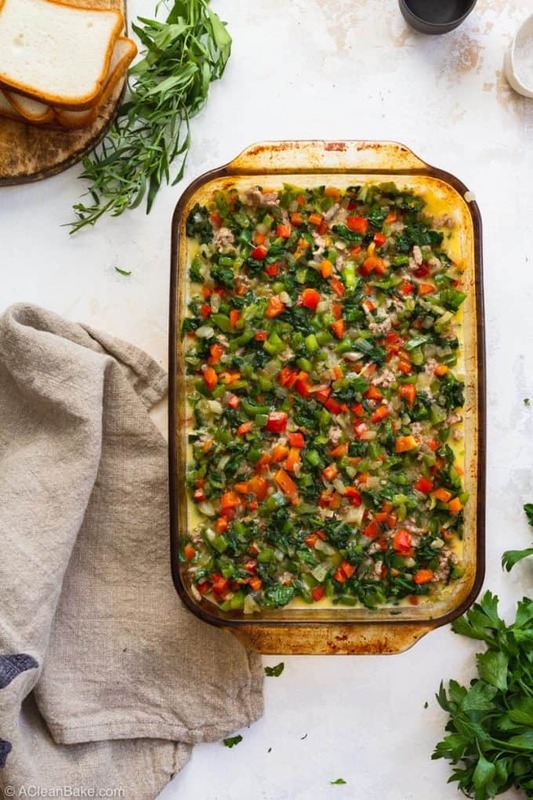 The morning that you want to serve the breakfast casserole, simply uncover the pan and pour the eggs over the bread, meat, and vegetables. Then bake! Alternately, you can bake the casserole, let it cool completely, and freeze it (either whole or in slices). Defrost and reheat it in the microwave for a quick breakfast! The best part of this recipe isn’t how easy it is, but how adaptable it is! Every layer of this casserole is customizable to your taste. As I said earlier, Udi’s Gluten Free makes a multigrain sandwich bread. So, if you’d like a little bit of a nuttier flavor to the base of your casserole, you can use the multigrain bread in place of the white bread that I used. Using homemade sausage for the middle of the casserole is not only healthier, but gives you infinitely more flexibility than using store bought. 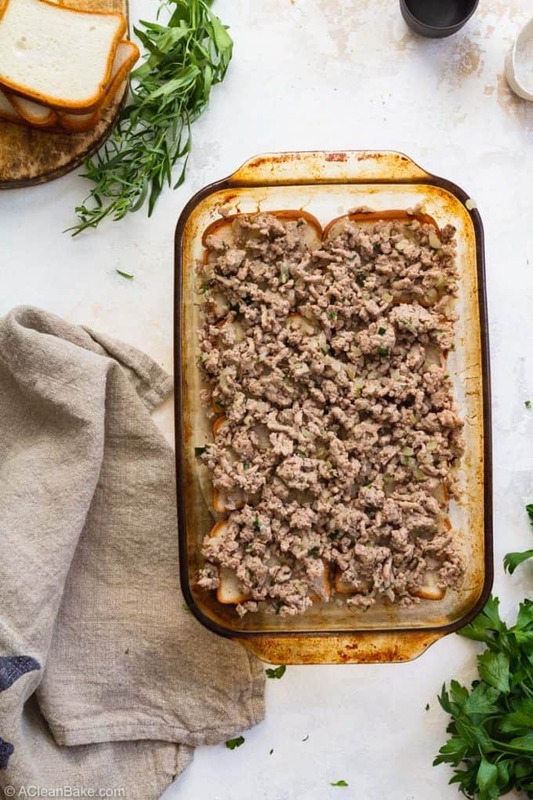 For example, I like to use ground turkey as the base of my sausage for this recipe, but if you’re a fan of pork sausage, you can easily swap in ground pork instead. Likewise, if tarragon isn’t your thing, and you prefer the flavor of Italian sausage, you can leave out the seasonings that the recipe calls for, and season to your taste with a good quality Italian seasoning spice mix instead. Likewise, the veggie layer isn’t set in stone. A bell pepper is always great to include, but beyond that, you can go crazy. Use kale instead of spinach, or swap out one of the bell peppers for mushrooms. Just don’t use anything too watery (stay away from lettuce and cucumber) or too tough (root vegetables won’t cook through, so I don’t recommend them). You can also use green onions in place of the sweet onion called for in the veggie mixture. And cheese! Add it! I made two versions of this casserole, and one had cheese. Personally, I didn’t feel it was an essential ingredient, so I chose to leave it out to make this casserole dairy free. But you can always add a layer of shredded cheese (about 1 cup) between the meat and vegetable layers. It also doesn’t hurt to add a little bit to the top of the casserole in the last 10-15 minutes of baking. Although shredded cheddar cheese is a popular choice in other recipes, I don’t recommend something so sharp in this version. Provolone, mozzarella, or something similarly mild will work best with the flavor of the tarragon in the sausage layer. I’ve tested this with a mix of provolone and mozzarella, with a handful of shredded parmesan on top, and it was perfect. Ultimately, it’s your breakfast – so make it the way you like it! 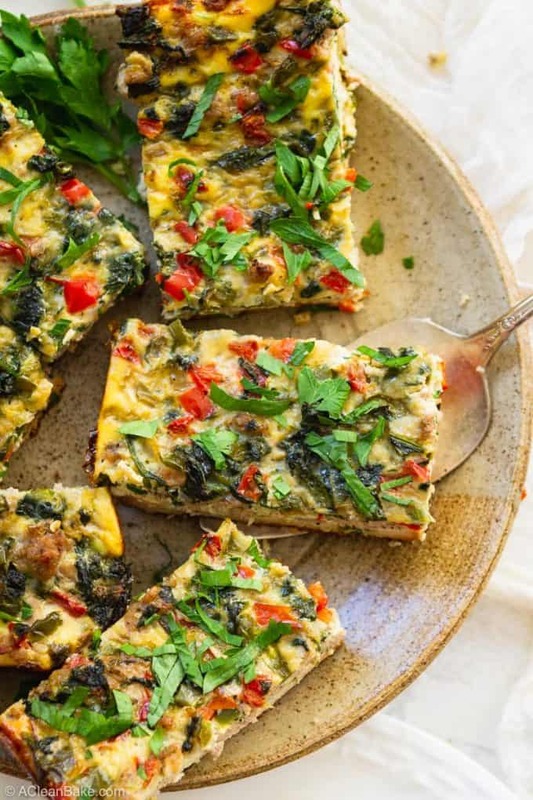 In just a few simple, real food layers, this gluten free breakfast casserole provides a hearty, one pan meal for a crowd, or stocks your fridge with healthy breakfast for the week. Plus, you can prep it ahead and it's freezer-friendly! Grease a 9"x11" baking pan. 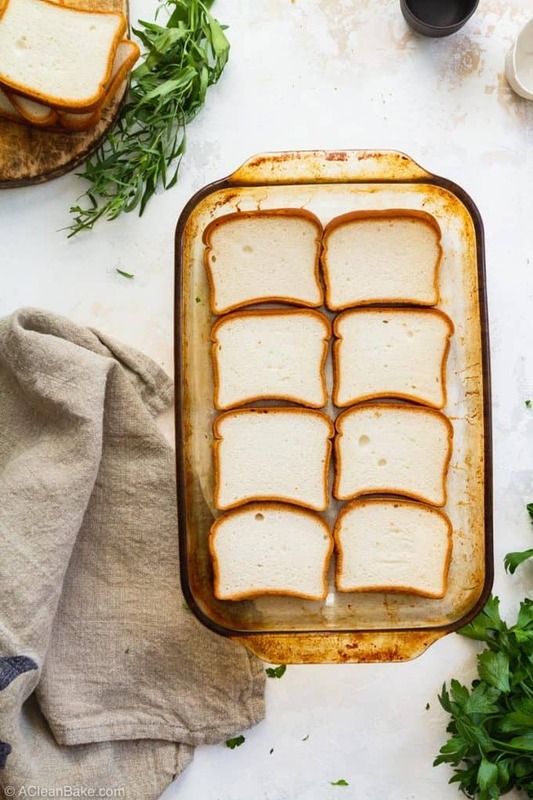 Arrange the slices of bread in a single layer, covering the entire bottom of the pan. Set the pan aside. Preheat 2 tablespoons of oil in a large saute pan over medium-high heat. Add half of the minced onion and reduce heat to medium-low. Sweat the onion, stirring periodically, over medium-low heat until onion is softened and translucent. Add the ground meat and use your spoon to break it up into small chunks as it cooks. When the meat is about halfway cooked, add the tarragon, 3/4 teaspoon black pepper, lemon juice, and 1/2 teaspoon salt. Cook, continuing to break up the meat into small pieces, and making sure it is evenly seasoned, until meat is cooked through. Use a spoon to transfer the meat to the baking pan. Spread it into an even layer on top of the bread. Do not pour the liquid from the bottom of the pan over the bread (you can discard the liquid). Wipe out the pan and return to the stove. Preheat the remaining 2 tablespoons of oil in the pan over medium-high heat. Reduce heat and add the remaining minced onion. Sweat the onion until softened and translucent. Add the minced peppers, chopped spinach, remaining 1/2 teaspoon black pepper, remaining 1/4 teaspoon salt, chili powder, and garlic. Cook over medium-high heat, stirring periodically, until the vegetables are softened but not fully cooked. Transfer the veggie mixture to the baking pan, distributing it evenly over the meat layer. Discard the liquid at the bottom of the skillet. In a large mixing bowl, whisk the eggs, then whisk in the milk. Pour the egg mixture into the baking dish. Shake very gently to make sure it permeates all of the layers of the casserole. Bake for 70-75 minutes until firm. If you find that after about 75 minutes, your casserole is still a bit watery, increase the heat to 400°F and bake another 5 minutes. If you need to use up the rest of the bunch of tarragon, be sure to add this recipe and this recipe to your dinner plan! If you tolerate dairy, you can add 1 cup of shredded cheese between the meat and vegetable layers. You may also want to add an additional handful to the top of the casserole in the last 10-15 minutes of baking. I've found mozzarella and provolone to work well in this recipe. I also like to add shredded parmesan on top. If you like your food on the saltier side, feel free to add up to 1/2 teaspoon to the egg mixture. Nutrition information is calculated using ground turkey, not ground pork, and almondmilk as the milk option. Grease a 9x11" baking pan with oil or cooking spray. Add 8 slices of Udi's Gluten Free Sandwich Bread in a single layer. Looks delicious! Quick question: How do you thaw your Udi’s bread? I can only get it in the frozen section and have yet to perfect a decent way to thaw it! I thaw mine in the fridge overnight!